MINISTER of Local Government and Housing, Datuk Dr. Sim Kui Hian cutting the ribbon as a symbolic launch of the celebration. 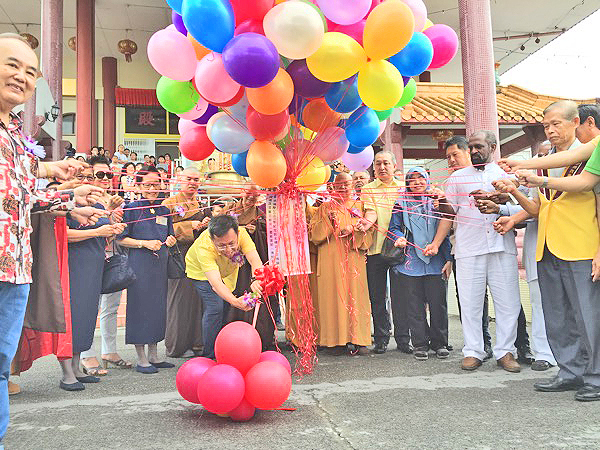 KUCHING: The Wesak Day celebration held in Malaysia Buddhist Association Sarawak Branch yesterday saw the participation of Christian, Islam, Sikh and Hindu organisations from Kuching in the ceremony. It was really a 1Malaysia celebration. Minister of Local Government and Housing, Datuk Dr. Sim Kui Hian said, this was reflecting the meaning of Kuching as a city of unity. “We unite by celebrating every festive season. We are very fortunate and we should never take it for granted and must safeguard our state harmony,” said Sim in his opening address. Sim also took the opportunity by wishing Happy Wesak Day to everyone regardless of race and religion. Meanwhile, he also said, on the celebration, people need to make charity which is sincerely from the heart. “It is not only a matter of giving donation or looking after the poor, it must be done from the heart. Regardless of what type of charity you do, sometime money does not matter, whereas a smile and love are more effective to change someone’s life,” he pointed out. Wesak Day is celebrated by Buddhists to mark three momentous events in Gautama Buddha’s life namely his birth, enlightenment, and his departure from the human world. Also present were representative from Malaysia Buddhist Association, Ven Fa Xun; Malaysia Buddhist Association Sarawak Branch chairman, Datuk Dr. Tay Chin Kin and Batu Kitang Assemblyman, Lo Khere Chiang. Big Turnout at Wesak Day Do 0 out of 5 based on 0 ratings. 0 user reviews.